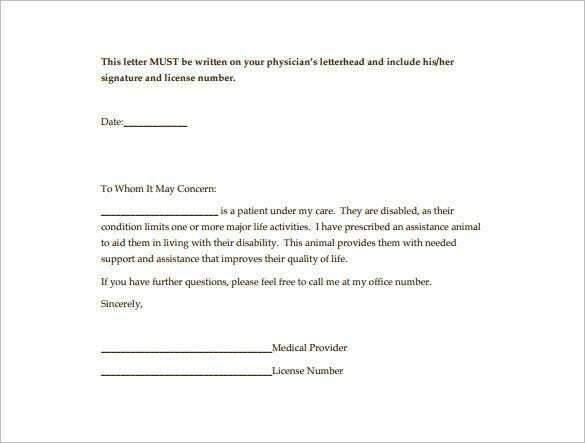 A Doctor Letter Template is a file used to write a note on a given patient to prove that they were indeed sick. A good example is the Doctor Note Template for Work, which acts as proof that an employee was out of work for a genuine reason. There are three common file types used: excel, PDF and word. Although PSD files also appear on the list of file types, they aren’t quite common in this category. Why do We Need a Sample Doctor Letter Template? Sample doctor letters are a medium of expressing a patient’s situation using these documents. 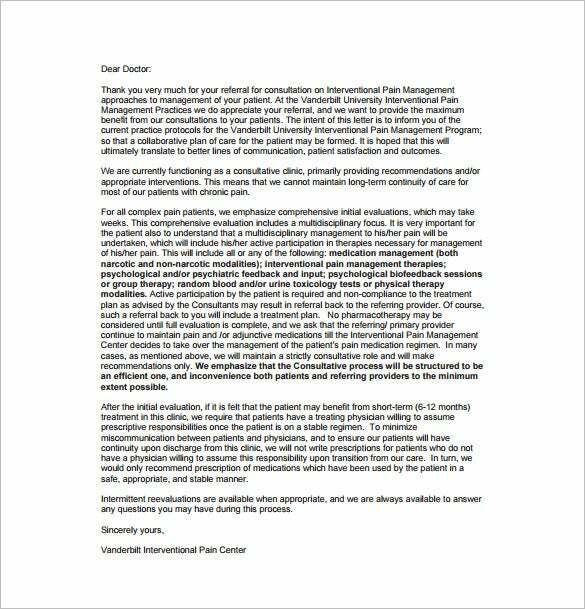 In these doctor letter templates doctors can fill in the patients’ actual condition. One of the templates is doctor letters referring the need of service dogs. Dogs are used as a remedy for patients these days. And because of this is because dogs love unconditionally. So if a person/ patient is in need of servicing dogs that serve as a remedy for making patients engulfed with trauma, problems or depression then they can apply for the same through these sample doctor letters. 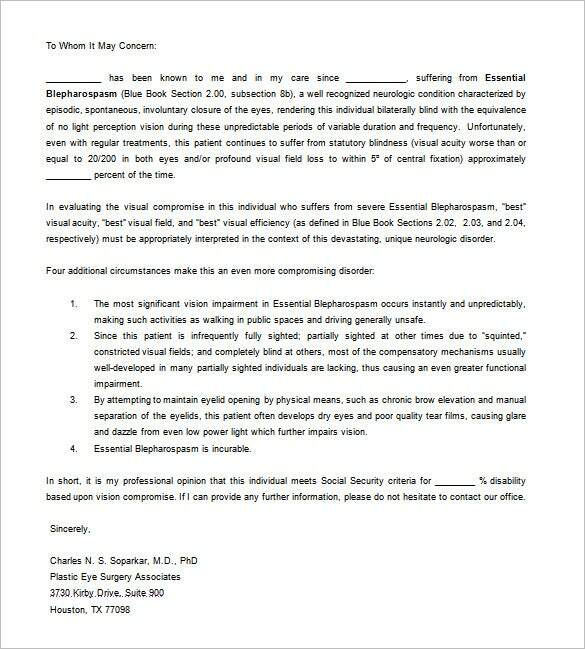 You may also see Doctor Appointment Letter Samples. Doctors around the globe have been a unique form of medicine. Dogs are being used as a remedy or medicine for treating patients. Patients both young and old feel happy, joyous and calm with dogs. Thus parents often use the option of hiring service dogs to treat their children. And this template is exactly for that purpose. 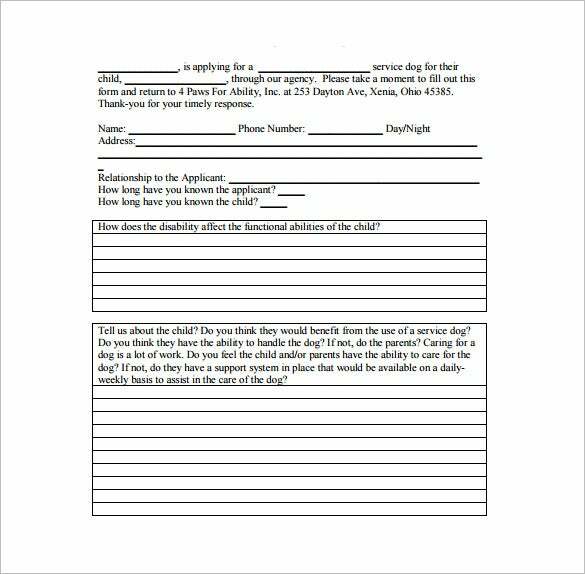 The template which is available in PDF Format can be used by parents so that they can ask their doctors to fill it up and express the child’s need of a service dog. You may also see Printable Doctor’s Note for Work Templates. 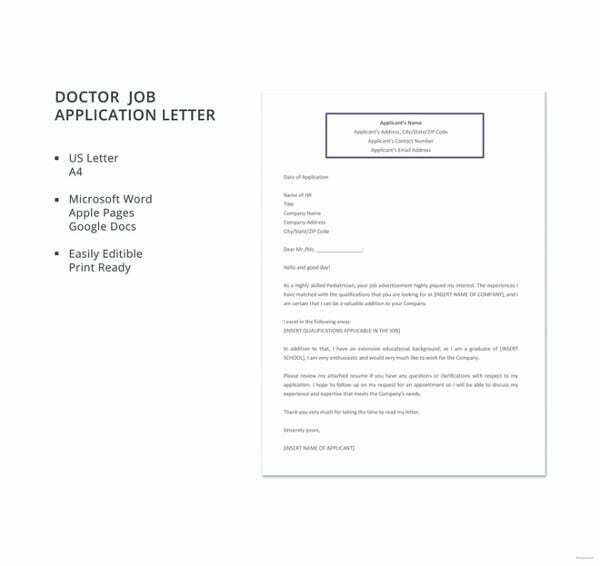 A medical doctor letter sample word template is an interesting sample of a doctor letter. 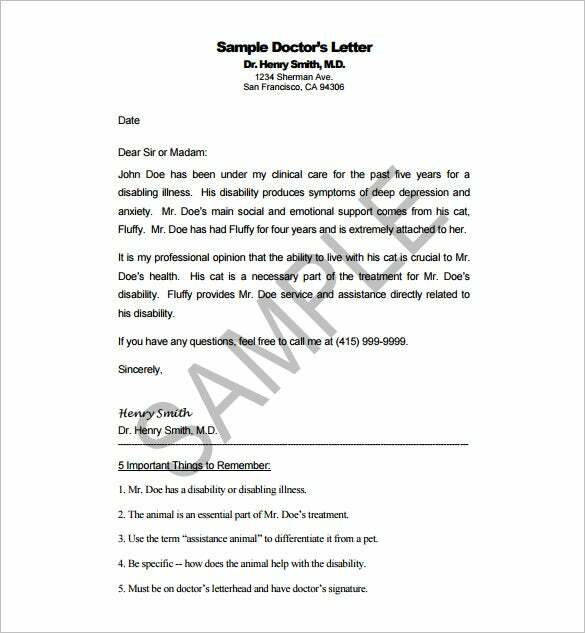 This letter contains a doctor letter for a patient with disabilities. 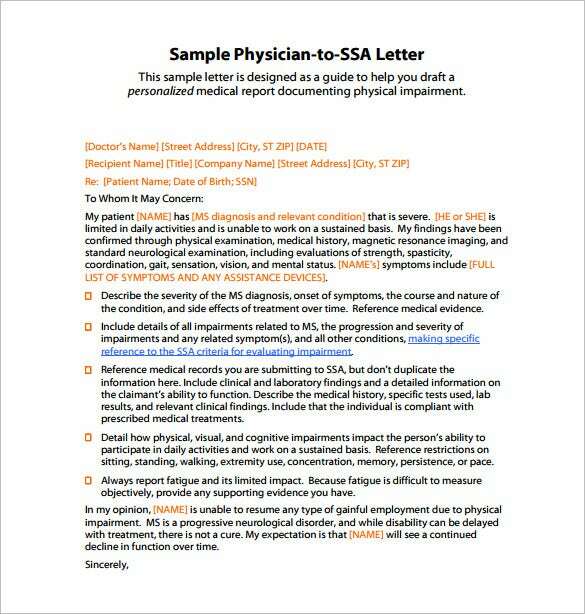 It is a simple but comprehensive letter containing all the necessary details related to a patient’s physical disability. It is available online in Word format for free use. You may also see Experience Letter Templates in PDF. 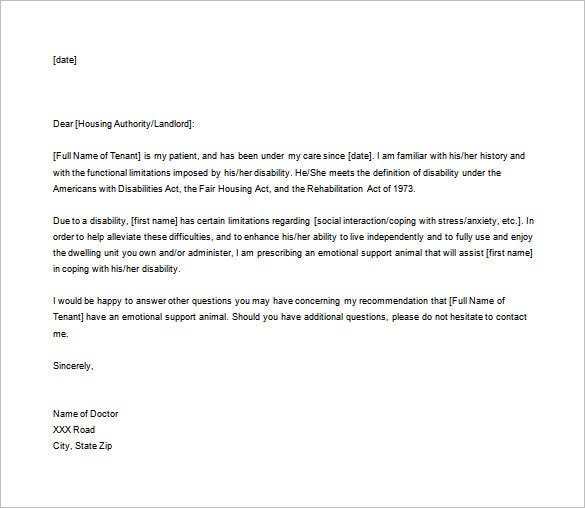 A disability doctor letter is another specific purpose doctor letter wherein a doctor can mention a patient’s disability and essential details related to it. In comparison to the previous disability template this one is more detail-oriented and elaborated. Containing doctor’s recommendation and case history of the patient, this template is available for free downloads from the link below in Word Format. 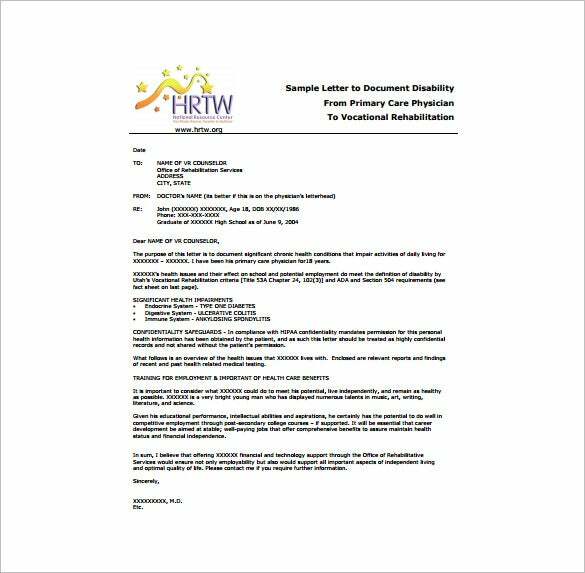 You may also see Emergency Leave Letter Templates. 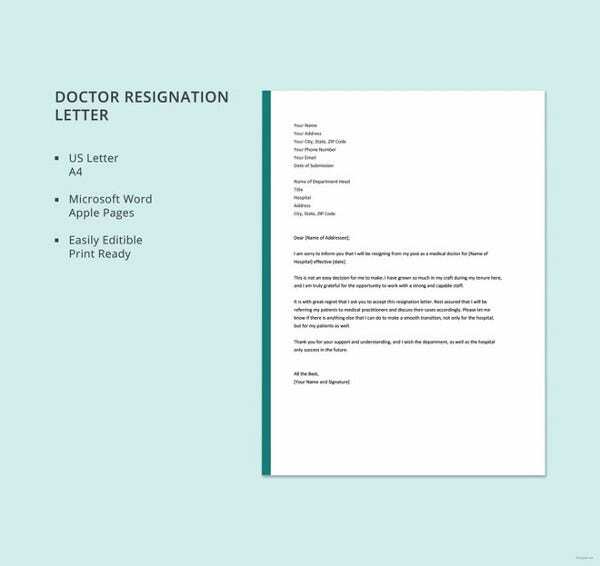 A dear doctor letter template is an exemplar template containing a sample doctor letter. Here is an example of a rare disease for which a patient needs a rare medicine. This template mentions a doctor’s recommendation on the same. This one is also available for free use from the link below. For users, this template is accessible in PDF Format. 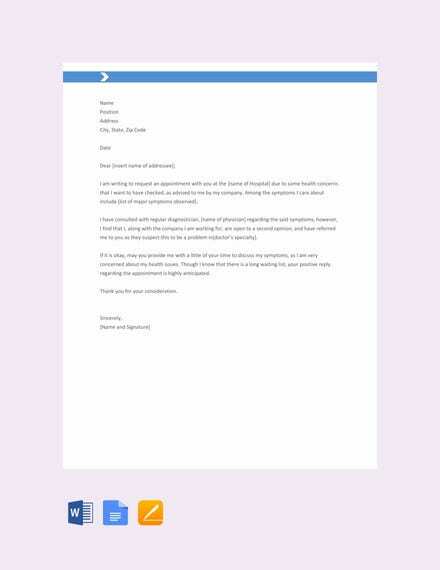 You may also check out here Work Experience Letter Templates. This doctor excuse letter would be issued by the doctor and it states that a certain patient is under his supervision and needs rest for certain number of days. Added to letter, the note offers the major points about the application in quick pointers. 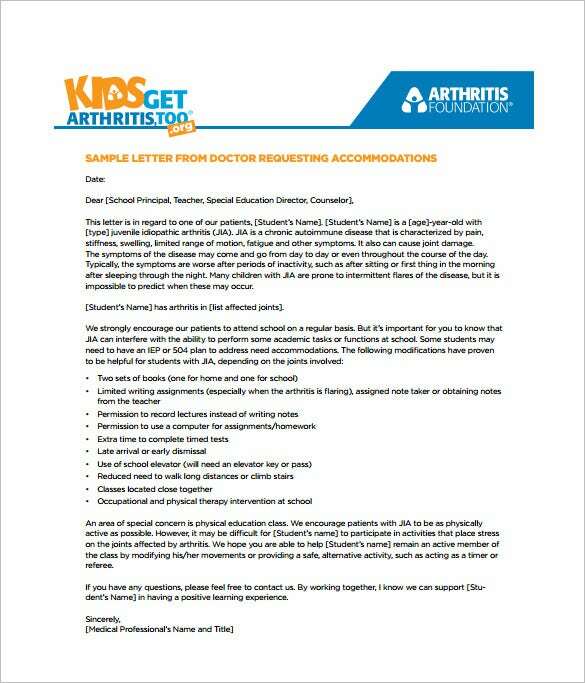 If your kid has special medical condition that prevents him from attending regular classes in school and you would need a note from the doctor to get a special permission for the classes from school, this note would be helpful. The note needs to be accurate. The information provided must be convincing and valid. Use the Free Doctor Note Templates as provided without making any changes. When do We Need a Sample Doctor Letter Template? 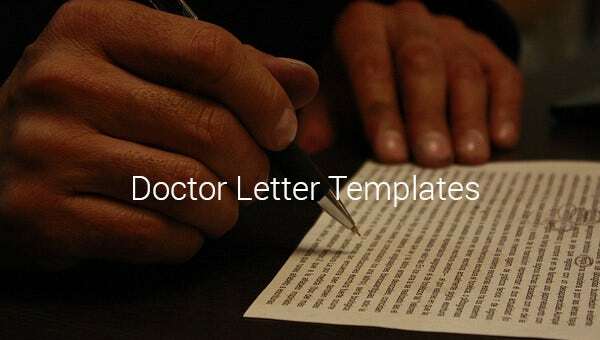 Sample doctor letter templates is a great collection of letters from doctors letter collected from various sources and assembled under one portal. Each of these template is unique an helpful that a person can use for helping the note down each patients’ true portfolio. Office goers can use these templates, after getting it filled up by the doctor, for use in their office. These templates are effective and legitimate. Thus these are great choice. 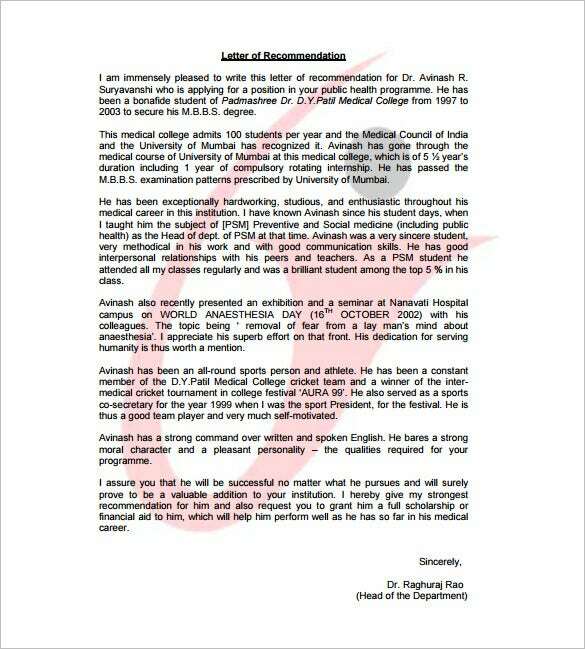 You may also see Medical Leave Letters. 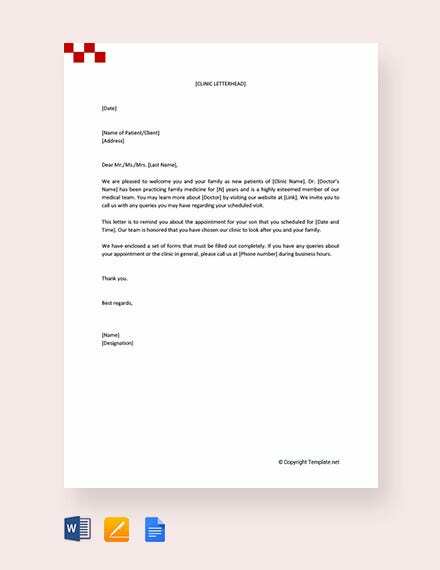 What are the Benefits of Sample Doctor Letter Templates? 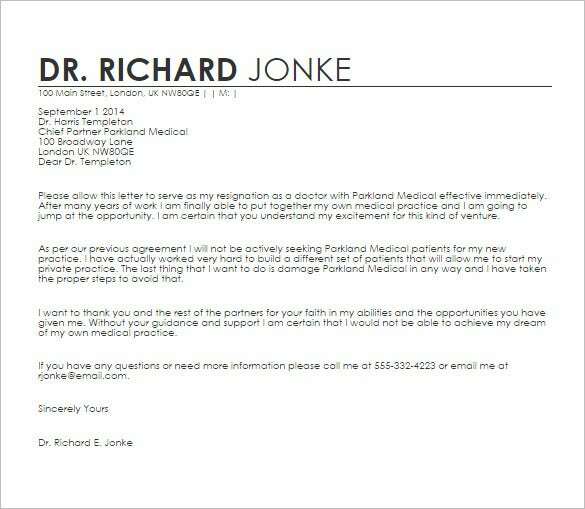 Sample doctor letter templates are a beneficial collection of templates. Firstly, since they follow a pattern thus they can be used as it is. The user needs to get it filled up by the doctor after downloading it and then printing them. Also, these templates are easy to access. Since these templates are available for free use and at one place. So a user needs notpay any undue costs as well as undue time on searching for a good-quality doctor letter over the web. 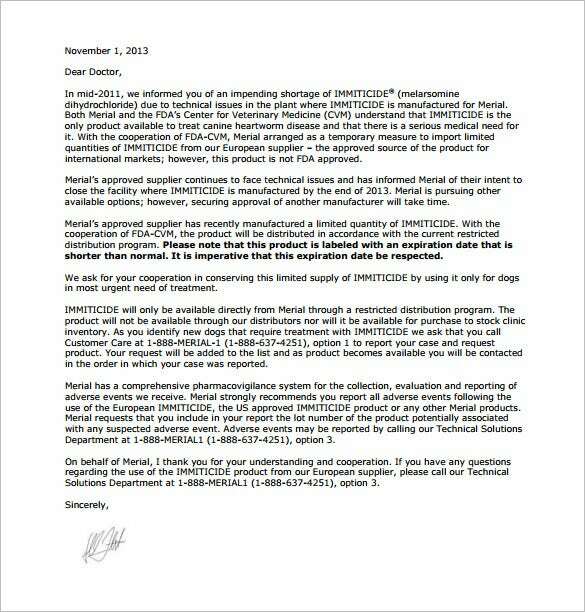 You may also see Patient Termination Letter Templates. A legitimate and ideal way o finding a good doctor letter is looking it up in this portal. Each template uses quality content which is double-checked by the experts. 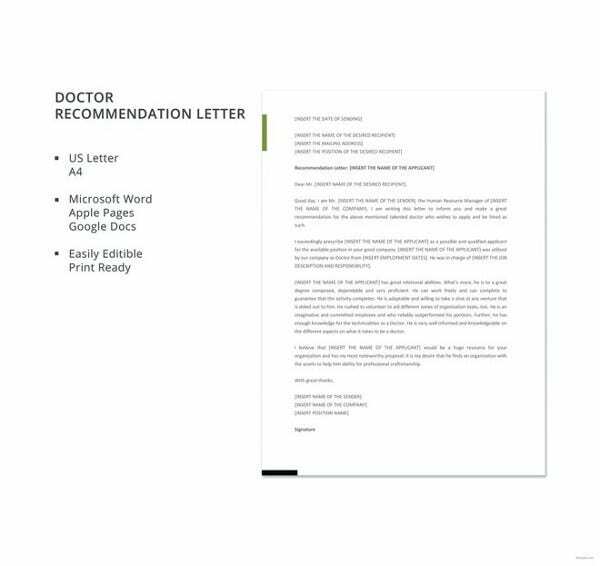 Thus users can rely on these templates in order to choose and download an ideal doctor letter template. These templates are absolutely free of cost. 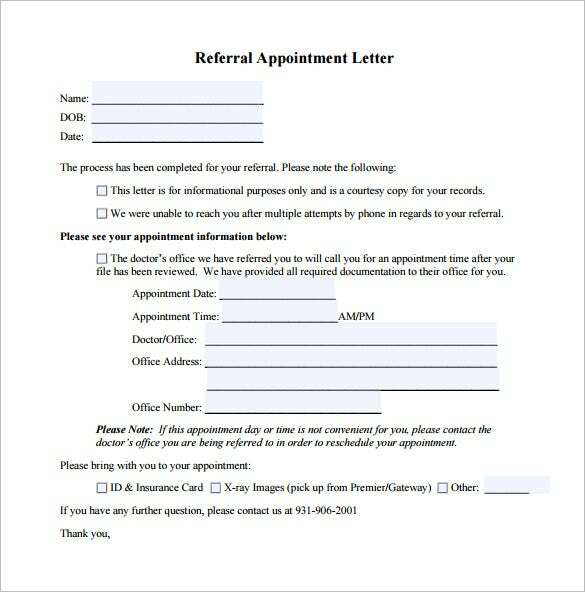 You may also see Sample Appointment Request Letters.